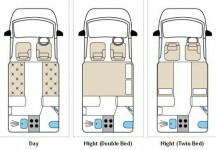 This is a 2 berth motorhome with an end kitchen. The Orian Zeta has an internal colour scheme of sky blue and cloudy cream and the cabinetry is of a light hue. Next to the rear nearside door is the kitchen and bathroom, while the fridge is beneath the worktop forward of the door. The cabinets provide plenty of storage space and the carpets are removable and come out in sections. The kitchen offers a full cooker woith electric hotplate and a stainless steel sink and drainer. The fridge is Dometic’s 77 litre version. The bathroom is practible with white moulded plastic finish, Thetford cassette toilet and separate shower head. Ultraheat mains powered space heater, electric step 5 speed manual.